Heya Hook-Mates! Mikey here on deck of the Crochet-Arium project. In cooperation with Creativ Festival, Crafting For A Cure and a gift sponsored by Furls Crochet Hooks, I have an update. Today marks the first day of starting to receive donations by mail from our fans. We are working on building an official 8 foot x 4 foot display aquarium all done up in crochet. We are appearing at Creativ Festival where our entire booth, 30 feet x 20 feet, will have an underwater theme. To give tribute to those who are participating by mailing us sea creatures, corals, and anything you can think of that is sea related, I am opening up a Flickr Gallery Page to honour those crocheters who are involved. This is open to anyone that would like to participate. Remember, we have a giveaway for those who enter 5 sea creatures or more. I am giving away a Furls Crochet Hooks, value $50 or you can choose the Crystal Bracelet. 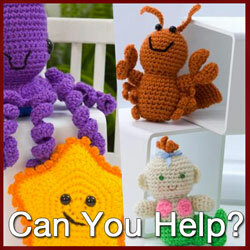 To get free patterns and inspiration, visit our official Crochet-Arium Entry Page. I will be adding an easy to access gallery on The Crochet Crowd Website as well. Keep in mind that donations and any cash raised is going 100% to Crafting For A Cure! This entry was posted in Crafting Shows and tagged Aquarium, Crafting For A Cure, Creativ Festival, crochet crowd, Crochet-Arium, Exhibit, Furls Crochet Hooks, Heya Hook Mates Mikey, Mikey, Toronto, Under, Water. Bookmark the permalink.